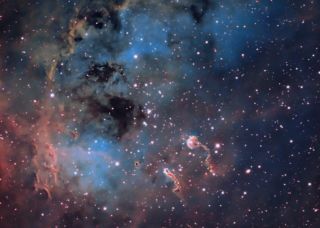 Emission nebula IC 410 lies roughly 12,000 light-years from Earth in the constellation Auriga. Astrophotographer Steve Coates of Ocala, Fla. sent SPACE.com this photo on Dec. 1, 2013. Cosmic tadpoles appear to swim through a distant celestial sea in this beautiful night sky view captured by an amateur astronomer. This image was taken by astrophotographer Steve Coates shows IC 410 — an emission nebula roughly 12,000 light-years from Earth in the constellation Auriga. A light-year is the distance light travels in one year, or about 6 trillion miles (10 trillion kilometers). The star cluster NGC 1893 can be seen toward the center of the image. This star cluster is actually responsible for the shape of the tadpole-like structures, which comprise leftover hydrogen and dust from the formation of the cluster. Their "tails" are caused from the solar wind coming from the stars of NGC 1893. Coates took this image from Ocala, Fla., using Ha, OIII and SII filters and processed using Hubble palette, assigning SII to red, OIII to blue and Ha to green. He used a QSI 683 ws-8 camera, Astro-Tech 8" Ritchey-Chrétien telescope, mounted on a Losmandy G-11 with Gemini II equatorial mount to capture the image, which he sent to SPACE.com on Dec. 1, 2013.